This article of mine was first published late last year in The Australian Wood Review, and so I can now reprint it here on Stu’s Shed (as per a specific arrangement with AWR). It is a well-known aphorism that first-impressions count, and both the designers, and manufacturers of the Excalibur EX21 Scroll saw knew this very, very well. A scroll saw is not something that needs to look like a prop from Star Trek, or encased in plastic to such a degree it disguises its real form. This scroll saw looks, and feels serious, and it has a price tag to prove it. The whole unit has a very utilitarian design: you need a flat working surface, so there’s a large flat surface of plate steel. A frame and base – more plate steel bolted together. A rack and pinion system to make angled cuts – even more plate steel. The machine is solid, and well engineered. For angled cuts, the EX21 uses the same concept as a increasing number of scroll saws, in that it tilts the blade (and mechanism) over, rather than angling the base. From an operator’s point of view, this means your workpiece remains on a large horizontal work surface providing ideal access and control, even when performing cuts up to 45 degrees to either side. To tilt the assembly over, the EX21 uses not one, but two rack and pinion mechanisms at either end of the tool so the mechanism is smooth and solid. The motor protrudes out of the side of the tool, and connects directly into the oscillating mechanism, rather than relying on belts to transfer the power from the motor. The motor is also direct current, so it retains full torque throughout the variable speed range of 400 – 1550 strokes / minute. If you strip a scroll saw down to its fundamental principle, it is to take a fine blade, and oscillate it rapidly up and down, and even here the EX21 is a superior machine. The drive is transferred to the blade via a twin parallel link drive, so instead of having a long arm top and bottom that oscillates (and due to that length sacrifices a huge amount of the power developed by the motor in getting it to the blade), this has two links – one for the top of the blade, one for the bottom that delivers the power right to the end of the arm before it is converted at that point through a couple of very short arms to produce the oscillating blade. The actual speed of oscillations is the same as other machines, but the difference in developed power is substantial. For an operator, this means a difference between stalling the machine, or having it to continue cutting even in trying circumstances (such as thick stock (up to 53mm), and/or tight corners) and in difficult timbers. Also, it is claimed to reduce overall vibration of the machine, and while this is true throughout the majority of the oscillating speeds, vibration became quite noticeable at the highest speed settings. 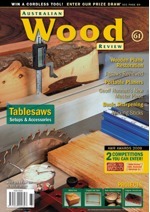 Having the scroll saw clamped down to a solid bench, or the separately available stand should reduce that considerably. A obviously common task when using a scroll saw is changing the blade, and particularly feeding the blade into the middle of a pattern for an internal cut. The blade clamping mechanism and independent tensioning mechanism makes this task a breeze. The overall blade tension is set by the knob at the back of the machine, and it allows a significant amount of tension to be exerted on the blade, which will optimise its performance, both in quality of the cut, as well as its ability remain on track and cut straight (vertically), without the blade trying to squirm during the cut. However, there is no need to wind off that tension for a blade change, as the blade clamping mechanism independently releases and reapplies that tension with its “flip tensioner” during a blade change. The actual clamp itself is also very simple, and importantly, tool-less. Finally, the top arm lifts well clear of the work (still with the blade attached at the top point), making it very easy to feed into the next hole for another internal cut. The arm can remain in the raised position, but I did find the method to achieve that a little questionable. It relies simply on a bolt passing through the housing to rub on the arm, and the friction to keep the arm up. I would have thought a more positive method for locking the arm in the upper position would have been preferable, and sometimes found that resorting to a block of wood provided a more positive (although undesirable) solution. If the arm is lifted too high, it actually impacts on the threads of another bolt that holds a side-cover on. Do this too hard (or incorrectly lift the saw by the top arm), and there is a risk of damaging the threads of this access bolt. The work-holddown seems to have been a bit of an afterthought – not that it is incorrectly positioned, but it has not had the same amount of precision engineering treatment that the rest of the saw has benefited from. Also too, the very standard concept of the air pump produces very little airflow (no worse than other scroll saws), but again I would have liked to have seen a better solution. A light source may have also been a sensible inclusion, particularly if it was on a flexible arm utilising fibre optics, or modern LED light sources so it can be positioned where required. At least there is no laser! The bottom line: This is a well engineered tool, and really sets the standards for scroll saws. It is a very expensive bit of kit, but if you are serious about using a scroll saw, this is a serious, uncompromising machine. I’ve still been working on the panel clamp review, and a big part of it can really be considered reverse engineering the product to see what really makes it tick, and when comparing different brands, it also provides a level playing field. When getting to compare different brands, and having started the reverse engineering process, you also learn a great deal about design in general. Choice of thread types, diameter, pitch, length, material, bar section, handle length, diameter, pin material, diameter, on and on. It really is interesting to see the decisions made by the engineers when the clamps were originally designed, and in some cases whether an engineer seemed even involved in the process at all! I always find I’m disappointed with some products – they promise so much, and fail to deliver, and I just see them as a complete waste of the materials used in their construction. The worst examples of that is often when a product has been reverse engineered, quickly and poorly as so many companies have been doing – rather than actually researching the product’s purpose, they take an existing product and make it as cheap as possible, avoiding the cost of actually using engineers to properly research and design a decent product. Others get the majority of the design right, then forget that there is a need for a human operator! On the other hand, after looking at a wide range of product, you do formulate a definite wish-list of what you’d want to see in a set of clamps for the shed. My dream- a wall set of good clamps of a range of sizes (and multiple copies of each size), such as you see on the walls of good workshops everywhere (and particularly on TV / WebTV)! The latest issue has just hit the streets, and as always has lots of interesting content. Including a full-page review by yours truely of the Excalibur EX21 Scrollsaw. For obvious reasons, I can’t reprint the article here – if you want to see it, you have to buy the magazine! However, any feedback on it (or the previous review of the Pro Drill-press table) is welcome. Not been having much luck recently with the short courses at Holmesglen – I don’t have any visibility of the overall performance of courses at the moment, whether overall attendance is dropping, or if just hobby pursuits are having a bit of a downturn in the current economic crisis, but my recent introductory Triton woodworking course, and shed course have both been cancelled for lack of numbers (hard to run a course with 0 attendees), and the same has happened for this weekend’s toy making course. Bit of a shame really – was looking forward to that, and have done quite a lot of preparation work for it. Have a number of tools just waiting in the wings to be taken along for people on the course to get to play with (including thicknessers, bandsaws etc), so I guess they can all be moved back into deep storage again – there isn’t another one now until Feb 21, so there is no point having the extra workshop space taken up with them for another 3 months. Was in Bunnings yesterday buying some particle board for the backing of a noticeboard I’ve been asked to make for work (video is in the pipeline), and found the plans for a picnic table, normally priced at $9.95 (because that extra 5c makes all the difference! ), but were being dumped for 50c. Always worth having a quick look at the sales tables – all sorts of strange things in strange juxtapositions when they are thrown together on the tables! Speaking of Bunnings, I will be doing another Triton demo evening at the Pakenham Bunnings next Wednesday fwiw. Was playing around out in the shed just before, in particular finding different ways to use the Lidwig cable hanger after shooting a quick review video earlier today of the various Lidwig clamps. It is always interesting how one idea leads to the next, and sometimes how a solution comes right out of left field. So quite a successful day all told. Tomorrow will be interesting as well. It is the last meeting ever of the Triton Woodworkers Club in Melbourne, so for me, that will be the end of a 6 year relationship. I bought a few things during the club auction, including the storage cabinet, so that will certainly be put to use improving the storage in the shed. Kind of nice to have small momentos like that too – gone, but not forgotten. Always wished I could have gotten one of the bars out of the wardroom of one of the warships I sailed on, before they were sunk as dive sites. Oh well. Anyone for a drink 100′ down? (I really have to dive my old ship one day). Must be late – getting nostalgic.